Red Strawberry Stems and Leaves? Q: Red Strawberry Stems and Leaves? What causes the strawberrie stems to turn red? we set out a acre of chandlers and we were late due to the weather they were not in the ground but 5 days before it frosted on them we were worried they might have started going into dormant stage because of the stems turning red. Answer to: Red Strawberry Stems and Leaves? Strawberry plants naturally have a red pigment in them. Red stems depend on the genetic expression of the particular plants you have, and red stems are completely normal. Most strawberry plants have enough chlorophyll in the stems to overwhelm the red coloration and make the stems green. Red stems are nothing to worry about. Red strawberry leaves, however, are a different story. If your strawberry leaves are turning red, they are likely dying. Some fungal infections can cause them to die. Other times, the leaves are just dying because they are old. Regardless, strawberry leaves turning red do not serve a helpful function for strawberry plants and should be removed and discarded. Can I bring the strawberries in the house for the winter? I live in NYC. I had some red leaves which I removed too and my stems are long and red which I like. I am constantly concerned about it and am looking out for any signs of infections. There is a group of around 3 leaves that seem to get getting red at the tips and stem. Should I remove them? And where do I remove them from? The base? This is my 1st strawberry plant! In the first year, it is standard practice to remove the blooms to allow for better root development and a heavier harvest the following year. So, this first year, I would recommend snipping the blooms and following the other instructions here. Good luck! Hi. My strawberry plant seems to have red leaves and stems this is my first year growing them. I guess my strawberry plant has got a infection but is there anything I can do to help the plant. Or is it just dead? If all the leaves are turning red, you probably do have a systemic issue with your plants or soil. If it is just a few of the older leaves that are turning red, the plants could still be healthy. Try removing the red leaves and see what happens to the rest. Good luck! My strawberry leaves are a light green. This is their first year. Is there a problem? No, they sound normal! Young strawberry leaves are typically a light green or yellowish green. As they mature they will deepen in color to the normal, rich dark strawberry green. Good luck! is it okay if my strawberry plant has walked off with a blackberry plant? Absolutely not. Walking berry plants belong in a museum. Hi! My strawberry leaves are turning brown. Everything is perfect except the leaves. The parts of the leaves that are green have some yellow mixed in it. Is it because the leaves are old? Do I need to take action to ensure that my strawberry plants get to give me a crop next year? It is possible that they are just old. The leaves will brown and eventually die back in the fall/winter. It is also possible that you have a nutrient deficiency or water imbalance. You may want to run a soil test to determine if there is a problem or not. Good luck! I have 2 strawberry plants. One is normal, one has red on the spiky tips and 3mm sized dots. Some of them are starting to have tiny browness inside the red dots. What is it? Is there anything to do about it? Your plants have contracted a fungal disease, most likely. You can use this resource to identify it. Good luck! Someof my strawberry plants have developed a bulging read stem, should I be concerned? Possibly. If the stem looks damaged, you might have a parasitic infestation. If it just looks red, I’d wait and see what happens. Be sure to remove any dead leaves/stems from the area to decrease the possibility of fungal infections, and good luck! Mr.Strawberry what if my strawberries have red leaves? what do I do? The best thing to do is remove them if they are starting to wilt. If the leaves in the center of the crown are still green and vibrant, no other action is probably needed. You might also want to test the soil to ensure that it isn’t deficient in any nutrients or minerals the strawberries need to thrive. Good luck! Do I have to do something about the red stems of my strawberry or just let it be the way they are? Just leave them be. Good luck! I planted my Lorans and a Quinalt a few weeks ago. I have noticed the Quinalt does have red leaves, specifically the older ones. I had red about a red root fungus(?). It said that the fungus is near impossible to get rid of and that aside from the plant struggling to fruit…well, just basically let the plant die and invest in something more tolerant next year. My questions; Is this info factual? Is there anything at all I can do for the poor thing I already have? I’ve been pinching blossoms and keep chemical-free. Suggestions? Thanks so much. Red steele root rot is a significant problem. It may be that your plants are fine, however. Red stems and leaves don’t necessarily mean your plants are destined for doom. 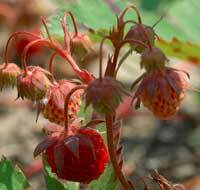 I’d start here: Diagnosis of Strawberry Diseases. Good luck! What kind of bugs leave brown holes in the strawberry leaves? Any insect that feeds on the leaves will leave such a mark. You might want to reference this resource to try to determine exactly what is damaging your plants. Good luck! What is the best brand of fertilizer to use? How often do you use it? Spring time here in Oklahoma. This page should help: Growing Strawberries. Good luck! You might have a nutrient deficiency in your soil. It would be a good idea to take a soil sample and have it tested to ensure adequate nutrition for your strawberry plants. Good luck! when do you transplant strawberry plants? This post on transplanting strawberries should answer your questions. Good luck! Should I cut my strawberry plants back in the fall? Your question is a good one! 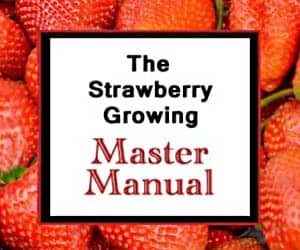 You can find the information you need to be successful with your strawberry plants, and the answer to your question, on the following pages: Growing Strawberries, Mowing Strawberries, Monthly Growing Strawberries Guide, Strawberry Renovation. Good luck!